UPDATE 8/20/06: The Rice Shoe Fence is Alive and Well! 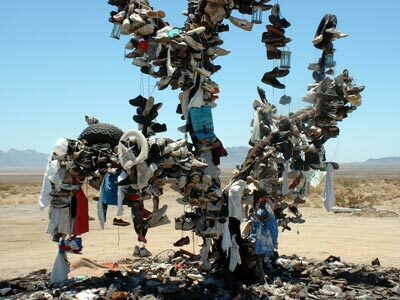 "My husband and I were driving eastward along California Highway 62 in Southern California when we drove past this crazy looking fence with shoes all over it! I had him slam on the brakes and back up so we could look at it! I told him it reminded me of a "shoe tree" I'd read about in the past (not remembering exactly where the original one was, but knowing it was out in the California desert somewhere). We got out and looked at it from all its vantage points, then decided to "phoon" in front of it for my brother John Darrow's Web site which has become a worldwide phenomenon in its own right The surrounding area does show places that have been burned and abandoned, and there are remnants of underwear hanging on parts of the fence and another scraggly tree, but the area has definitely been reclaimed by people dedicating their shoes to revive the "shoe tree fence" in its Rice, California location!" 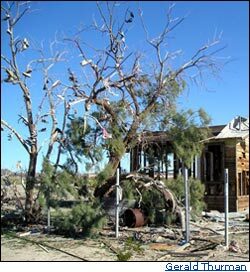 UPDATE 10/9/05: Death Stalks the Shoe Tree AGAIN! Someone really doesn't want the world-famous Rice Shoe Tree (shown here in its golden age) or the lesser-known Underwear Tree to grow back ever again. The footwear-laden tamarisk tree, including the stump, has been completely removed. Dirt has been piled over its former location almost like a grave. The Underwear Tree was burned to the ground, and so was the building next to it. But is this really the end? No! Check out the new Rice Shoe Fence! New species! The Rice Shoe Fence! UPDATE 12/22/04: Burned, but Still Has Sole! Gerald Thurman visited the Rice Shoe Tree and found that, despite the obvious damage, visitors are still adorning the charred remains of tamarisk tree with new offerings (and are those tiny new green shoots? We're not sure, but hopeful). 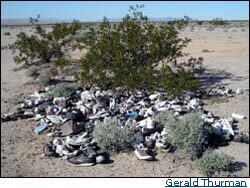 In the immediate area, he also found new additions to the underwear tree, a newly sprouted shoe tree, and a creosote bush "shoe mound." I'm sad to tell you that the shoe tree along Calif. Hwy 62 at Rice Road has been totally destroyed. My husband, Cory, & I passed by it on Saturday, July 10th, 2004, and it was fuller than ever, but when we later drove past the following Saturday, July 17th, it had been destroyed to all but a blackened stump sticking up about 3 feet from the ground. My husband (who's now 40) remembers stopping at the shoe tree as a child with his family on their way to the River. 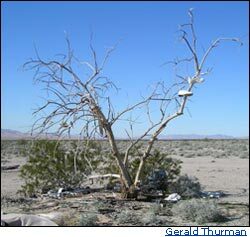 The original RoadTrip America photo of the desert Shoe Tree near Rice, California, was taken in early November, 2000. 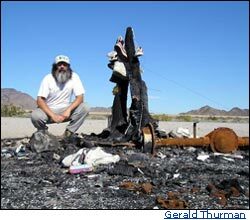 We thought the tree had reached its climax state then, but when Arizona road warrior Gerald Thurman visted the tree on November 12, 2002, he proved its blossoming had only just begun. Every branch of the venerable tamarisk sported at least one pair of shoes, and the ground was littered with windfall. Exponential growth might well have continued, but sometime between Thurman's visit and the summer of 2003, calamity struck. When Jillian Imilkowski took a picture on August 9th, it was obvious that a fire had blackened the tree and burned many of its offerings. But old shoe trees can obviously take the heat. Jillian's photo provides ample evidence that California Highway 62's unusual landmark was still perfectly capable of producing fresh fruit in August, 2003, even though it may never sprout new leaves. Second Generation Shoe Tree: The Bra Tree! Now check out Maureen Bryson's photo, snapped a little less than a month later. Still no green on the tree, but talk about major blossoming! We just hope that cooler weather and maybe even a rain shower or two might help the Rice Shoe Tree send out a few shoots of its own. Chances are actually quite good. Often called "noxious weeds" and denounced as "hard to kill," tamarisks have a long-standing reputation as survivors. Viles also reported that she contributed to the bra tree, but she declined to provide a photographic record of the event. We haven't been able to pinpoint the exact birthdate of the Bra Tree, but Thurman's picture, taken in November, 2002, appears to illustrate the first blossoms. Has it matured? Perhaps another Highway 62 nomad will be kind enough to snap a picture and send it our way.